Cork’s ‘Best Young Entrepreneurs’ were named at an awards ceremony hosted by Cork’s three Local Enterprise Offices (LEOs) in County Hall, Cork earlier this month. The winners were chosen from 45 finalists, shortlisted from almost 190 applicants in the competition which was launched this autumn by the LEOs as part of the nationwide search to find ‘Ireland’s Best Young Entrepreneur’ (IBYE). The LEO winner in each category receives significant investment in their business, with one overall winner in each of the regions receiving the accolade of ‘Best Young Entrepreneur’. Ireland’s Best Young Entrepreneur (IBYE) is an enterprise initiative run by the 31 Local Enterprise Offices (LEOs) around the country and funded by the Department of Jobs, Enterprise and Innovation and Enterprise Ireland. A €2 million investment fund is available through IBYE which supports young entrepreneurs through training, mentoring and direct financial investments. In the Cork North and West competition, the Best New Idea category was won by Fiona Edwards Murphy from Kanturk, who received €7,000 investment in her company, Apis Protect. The initiative helps beekeepers to prevent losses and increase the productivity of their hives through the use of unique in hive sensors and data processing technology. 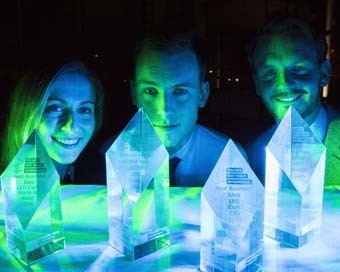 (L to R): Winners of ‘Best Young Entrepreneur’, Cork North and West, Fiona Edwards Murphy of Apis Protect; Cork City, Michael Sheehan, Milis Bio; and South Cork, Vincent Forde, Gasgon Medical. Picture: Emma Jervis Photography.